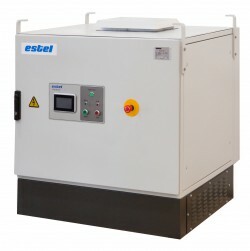 Manufacturing and R&D Corporation ESTEL is the developer and producer of power converter equipment of wide diversity. Found in 1870, ESTEL offers products and services of highest quality and innovation to the domestic and foreign markets. The products designed and manufactured by ESTEL correspond to international quality standards and are widely and successively used by the company’s Clients on a long-term basis. ESTEL has launched its first aviation ground support equipment in 1974. The company portfolio of aviation products includes frequency converters, airfield rectifiers, combined power units, etc. All the equipment is compatible with all available types of helicopters and airplanes, including Airbus, Bombardier, Boeing, etc. Additionally, all the equipment can be manufactured in accordance to the unique special technical requirements of the Client. ESTEL power converting equipment for aviation needs is manufactured by the latest innovation technologies that are uniquely and implicitly developed inside the company. Additionally, the Company equipment is certified in accordance to the international standards. ESTEL ground support power converting equipment is intended for solving contemporary timely problems of the partner businesses. Experience, science and quality are the three pillars ESTEL manufacturing stands on, providing stability for aviation businesses in any circumstances. Feel free to contact with us and get all the information you may need. Airfield rectifier is intended for airborne system power supply of the aircrafts with constant voltage of 28.5 V during the pre-flight maintenance procedure. Unlike the analogue units, ESTEL airfield rectifier allows for independent simultaneous power supply of 2 aircrafts. Power supply of the aircraft rectifier is performed from 3-phase AC current network with null wire. The equipment is characterised by a high efficiency factor (92% or higher) with output capacity of 36 kW. This equipment includes microprocessor control system with developed diagnostics and protection system. 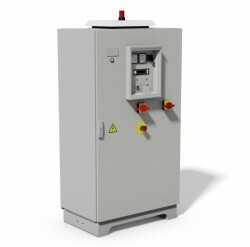 The rectifier consists of one cabinet, which has an input transformer, rectifier, filter and control system Airfield rectifiers can be manufactured in stationary and mobile versions. At Client requirements, airfield rectifier can be manufactured with different current limits. FCA type power converting equipment is intended for power supply of civil aircrafts’ airborne systems during their pre-flight maintenance and ground technical service. FCA frequency converter can be manufactured in both stationary and mobile versions. The equipment is manufactured in a variety of makes, with different technical characteristics and parameters. The output capacity of the ESTEL manufactured FCA frequency converters ranges from 5 up to 250 kVA with current frequency of 400 Hz. The equipment has high efficiency level and low energy consumption. Technical parameters of the equipment can be adjusted according to the Client’s special needs. Another advantage of the FCA Frequency Converter is its ability to provide additional central power supply of workshops and testing stands for the aviation industry enterprises. 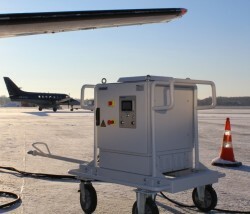 Aerobridge frequency converter is intended for the ground power supply of the aircrafts during their pre-flight maintenance. FCA aerobridge equipment is formed of two independent functional parts (or more, depending on special Client’s requirements), that can be joined or pulled apart on a defined distance. 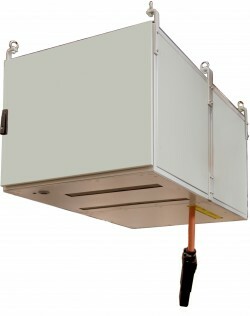 One or more cable coil cabinets can be provided in one FCA converter in order to provide power supply to one or more aircrafts simultaneously. The equipment is adaptable under any type of plane, with adjustable cable length of up to 40 meters. Additionally, the equipment is designed to be compatible with the helicopters. Another adjustment made by Estel is the ability of 24/7 power supply operation mode of the GPU. The adjusted feature is useful in terms of off-schedule service of aircrafts (in any period, including winter times) and when servicing airplanes and helicopters at low winter temperatures. Combined power equipment manufactured by ESTEL is intended for the airborne system power supply of aircrafts and helicopters. The equipment consists of frequency converter FCA-25 providing AC 3x200V with frequency 400 Hz; and 2-channel rectifier AV2x400x28, 5/48 providing supply 28.5 V DC voltage. The equipment can be used for engines’ start of aircrafts in 24/48 V operation system during the pre-flight maintenance. Combined power units are equipped with microprocessor control system and differ profitably by the high level of efficiency. These units, as long as others manufactured by ESTEL, have the availability for being manufactured in both stationary and mobile versions. Additionally, combines power units may include kit of input and output cables. Combined power units are certified to the Russian GOST 19705-89standard, EU standard DFS 400 and USA standard ARP 1148A.